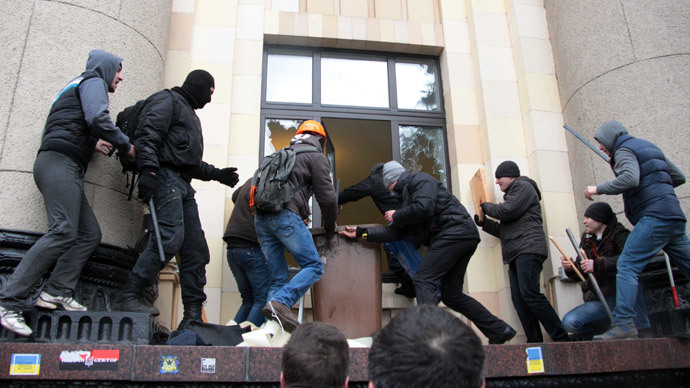 The police took a back seat when the Kharkov administration building was seized by armed nationalists from Western Ukraine and let pro-Russian demonstrators liberate it instead, the mayor of Kharkov Gennady Kernes told Kommersant. The political tensions in the largest city in eastern Ukraine, Krharkov have reached a pivotal point on Saturday during a peaceful rally “For protection of the city” at which tens of thousands, including children gathered. Someone threw an explosive package at the crowd from the administrative building held by a group of pro-Maidan protesters. No one was injured by the blast, but a group of pro-Russian activists broke through the cordon of Maidan supporters in order to recapture the building. Scuffles erupted resulting in injuries of more than 100 people. Gun shots were also heard from inside the building, as well as several more blasts. 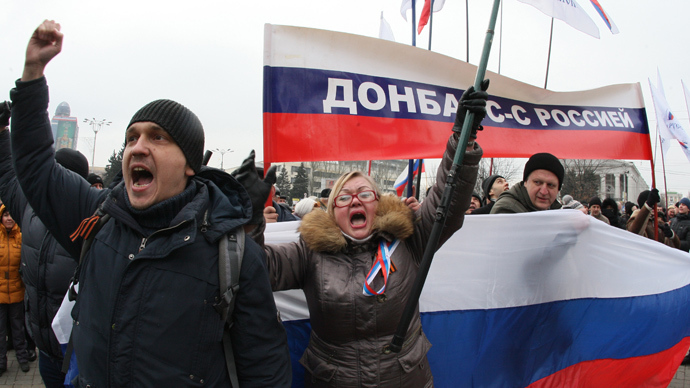 Eventually, the people have retook the building, raising a Russian flag over the administration for a few hours. Commenting on the incident mayor Kernes said that the people holding the administration building were ultra nationalist elements “who hid their faces behind masks, had weapons, including automatic ones,” the mayor told the Russian publication. “Then it turned out that these men came from Western Ukraine – from Lviv, Ivano-Frankovsk,” Kernes added saying that all types of “nationalists” took over the building. While the pro-Russian crowd with St. George’s ribbons tried to detain the nationalists fleeing the building, law enforcements “did nothing” to help them or stop the unrest, they just “waited” to see what happened, Kernes said. 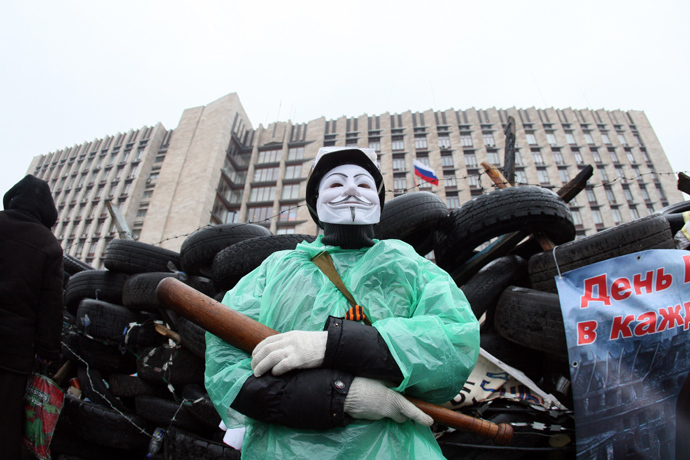 To protect the city against radical activists Kharkov residents have established militia units to patrol the city. Groups of 30-50 young men people were keeping the night watch till early hours of Sunday morning. Inside the recaptured building, the floors looked like the scenes from a battlefield with broken furniture, windows and blood stains. Commenting on the overall split in the country, Kernes stressed that situation in eastern Ukraine is different from the tensions on the Crimean peninsula. 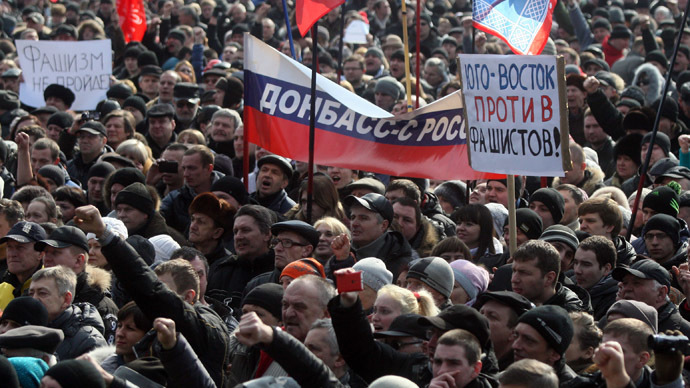 “In Crimea, the situation is quite different: it is an Autonomous Republic, they have their own constitution. And we live and work according to the laws of Ukraine [in Kharkov],” Kernes told Kommersant.